Reeled off four consecutive birds and followed them with an eagle. Had it to –6 but the golf gods took a few back. Finished –3. Free eats is your friend. 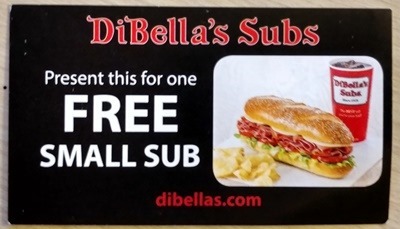 My buddy Gary Snyder hooked me up with a volunteer meal via a voucher the other day and he gave me a coupon for a free sub today. He manages a sub shop for one of the local chains. This entry was posted on Friday, July 15th, 2016 at 3:59 am and is filed under Uncategorized. You can follow any responses to this entry through the RSS 2.0 feed. You can leave a response, or trackback from your own site.